Hull Breach is a fast and brutal, new science fiction card game that blends the randomness of dice and card draws with the individual skill and tactical might of 2 or more competing player-commanders! 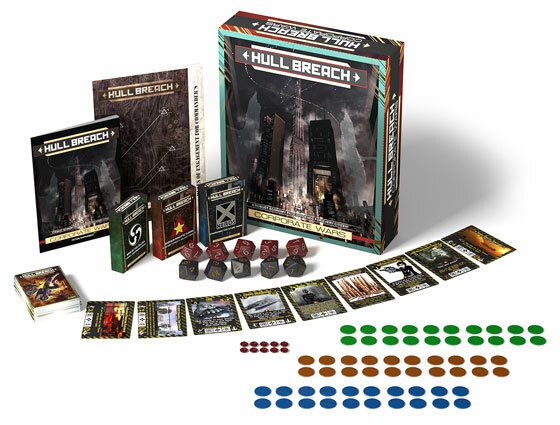 NSB Games presents Hull Breach! : The Corporate Wars box set. The Corporate Wars will include 3 pre-constructed decks(playable right out of the box! ), a full color rulebook, immersive Corporate Wars fiction supplement, ten 10-sided dice, tokens and economy counters. Designed by military vets, Hull Breach rewards aggression and strategic cunning as you build a fleet of warships and marines to hijack, scuttle and ultimately crush your opposition. The player-commander is initially armed with one of many powerful stations and a selection of varied military or economic modules all within a 55card deck of their choosing. The rest is up to the player! It has all the customization and collect-ability of the top CCG’s with the non random, dont-need-to-spend-a-fortune-to-have-fun, completeness of the best LCG formats. Our dark, no frills, space-is-dangerous fiction has an engaging and full universe that brings pragmatism and gritty realism to a genre plagued with cliches and camp. 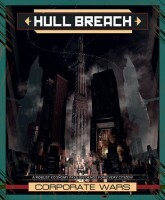 Hull Breach combines the bleakness and humanity of Battlestar Gallactica with the uncertainty and impending danger of HP Lovecraft and makes sci-fi exciting again! Add a Review for "Hull Breach: Corporate Wars"